Handrails sections with a profile that's almost square produce clean and simple lines that work particularly well with modern styles. Immix stair parts with glass panels and metal fixings will produce a staircase with a distinctive minimalist look and style for your home with a stylish over the post handrail that is fixed above the newel posts. The Richard Burbidge Immix Range of contemporary over the post stair parts are engineered from quality materials, with real White Oak veneer with 8mm toughened glass panels that simply fit into the pre-slotted handrail and baserail. 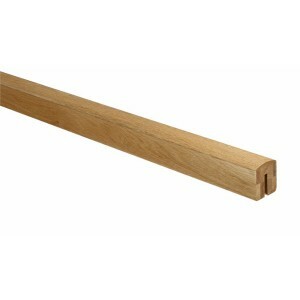 This range will easily produce modern looking stairs with clean and simple lines. The glass balustrade makes these stairs ideal when you want to create a sense of space and light in a hallway. The handrails, baserails, newels are designed and engineered for stability and strength. The parts are manufactured to match each other and be interchangeable so you can produce a staircase to suit your own specifications. The elegant oak contrasts beautifully with the gunmetal finished metal brackets and trims including wall brackets that enable the handrail to be mounted against staircase and landing walls. The Immix range is a premium range that offers a great way to refresh your stairs and bring your home right up to date. Instead of the disruption and expense of refitting an entire staircase, this system allows you to simply change the balustrading on existing stairs for a whole new look, although their contemporary look also makes them ideal for new builds.